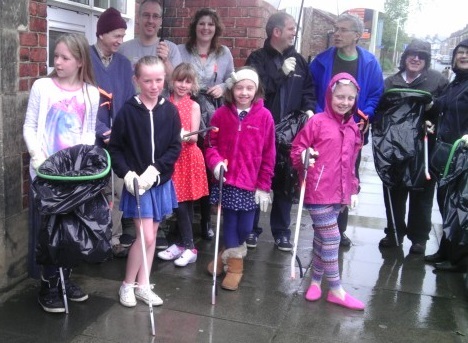 Our rainy day litter pick – last Saturday, 7th June at 12noon. Participants were from the Saturday morning Creative Family sessions at Scrap Studioarts, we wanted to help clean up our area and join in with the national campaign – Love Where You live. 16 people took part, including – Ward Councillors: Jan Taylor and Malcolm Wright and also Chris Taylor, plus the Borough Rd Nursery School Head – Lynn Millar. Jan Taylor, really embraced the event and printed/delivered 200 leaflets around the area, promoting the event, a few days before. The event only lasted for an hour due to the weather, when we called everyone indoors, even though the children were still very keen to continue, I think it had been quite a novelty experience for them, they loved using the picker sticks! The rubbish we collected in just an hour, along Borough Rd and side streets, mounted to 9 good bin bags! and we where all very proud to have made the difference to the now clearer, cleaner street. After our work we hope people will think twice about dropping their litter and put it in the bin themselves. Scrap Studioarts, arts and recycling, is the studio space of artist Yvonne Preston, who organised the event. Running a programme of workshops, offering materials and innovative ideas, time and space for families to work together in this great studio space located inside Borough Rd Nursery School. Our next event is to be – Cardboard Castles and Bens – on Saturday 12th July. A joint event with Borough Rd Nursery school, and using their wonderful garden. A free event for all the family, please come and join us for some major building fun! This entry was posted in Scrap Studioarts and tagged art workshops, arts, recycle, scrap, scrap store, scrap studioarts, studio, upcycle. Bookmark the permalink.